BitDefender Internet Security is an all around solution that protects your computer from destructive viruses and protects your privacy, even if you move around the web. All kinds of internet connections are monitored with the included firewall. e-mail traffic, shared directories, Internet content and instant messaging traffic to be examined. Monitoring of wireless network also prevents unauthorized access to your wireless network. The proactive virus scanner protects you from unknown viruses by already potentially malicious codes are detected. Moreover the software blocks attempts to steal confidential data (phishing). BitDefender Internet Security fits the firewall settings automatically to your environment. 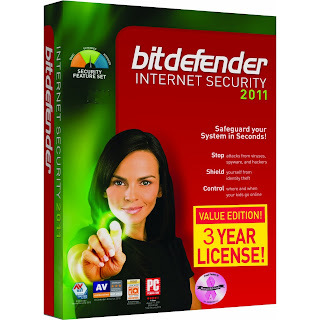 BitDefender Internet Security version 2011 offers three different user interfaces that will provide both novice users and professionals with all the necessary information. The Smart Scan technology enables a more resource efficient virus scanning. The proactive scanning technology detects viruses even earlier than before. BitDefender Internet Security 2011 provides families with the latest protection against Web-based attacks, faster performance for secure online gaming, and unrivaled parental controls. This GiveAway of BitDefender Internet Security 2011 provides 1 PCs with three years (starting from today 1095 days) of protection against viruses, hackers, spam, and identity theft without the slowdown!. The resource consumption is very moderate. We use BitDefender Antivirus by self because it found real threat earlier as many others. I wrote an article up on this page and here where BitDefender was one of the only AV's who had detect it. We draw random on 17. May 2011 the 15 winners from all comments and announce the lucky winners. To join the contest I appreciate if you click the recommend button on Facebook. Share the news with your friends that they also have the chance to win! I want to thank a good friend on behalf of all my readers for this great gift made available! Thank plz can count me in. Bitdefender Internet Security is a good Antivirus. Thanks for the contest and for this excellent Bitdefender security engine. Lucky the winners. Bitdefender is Complete security software for My pc. i love this... i really need key..
Wow excellent deal leechermods! please count me in.. It would be great to be among the lucky ones who will win these licenses for BitDefender. I have been using This Antivirus & I really need to extend my License for my next using of this great antivirus! Hope I can win a license for this Great Giveaway! Thanks a lot for this Giveaway Dude! please send me a license ! I would like to use this very good safety software. Thanks for this great giveaway. thanks for letting us a chance for having this prominent security suite, ya you are right that it does not slows down your PC providing maximum protection from all types of threats. wish i could win. Thank you for another good giveaway. Hearing lots of good thins about bitdefender past few weeks. Did the recommend thingy on facebook. Regards to all. Thanks for another nice giveaway. I would like to join in this contest. i'm using norton 90 day promo. good security software and great giveaway! thanks!!! Bitdefender Internet Security is the best antivirus. Very good program. Please send me a license. Thanks. please include me in this giveaway.Type your comment here. one times only join into the contest that all have equal chances! I like to take part in this giveaway as bitdefender engine is a good one and used by many like f-secure and gdata. Thanks. Thanks for this Giveaway.Please count me in.I am a big fan of Bitdefender Antivirus .It detects almost all sorts of threats.It also has very less false positives.I want it.Hope i win one. Thank you. Bitdefender is a great security software. Hope to win one license. Please count me in. Bitdefender is a great AV. Hope to win one.